All dogs should have their personal space respected. They should be able to go on walks without being rushed by unknown dogs and/or people. This is especially important when they are on lead and concerning off lead dogs approaching, never allow an off lead dog to approach an on lead dog. Some Dogs find some or all of the above even more distressing than others for varying reasons, so can their owners!. The Space Dogs charity raises money to donate to dog rescues through the Space Dogs Yellow Ribbon Trainers Scheme, raffles and charity boxes as well as the sale of official Space Dog merchandise. In the first year we donated to seven different rescues. How Coats for Dogs became involved? In October 2012 I was contacted by Judi Rudd, the founder of Space Dogs, and asked for a donation for the raffle they were doing to raise funds to launch Space Dogs. I donated two coats. Judi was so impressed with the style and quality that she approached me some weeks later with her idea for lightweight 'I Need Space coats.' 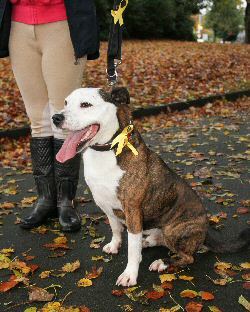 She had realised that the ribbon was not visible enough and wanted to progress the campaign - as she continues to do - to have a more visible sign that would also work when dogs were off lead as well as on. Together we designed the very first Space Dogs Hi Viz, lightweight, waterproof 'I Need Space' coats which can be used all year round! 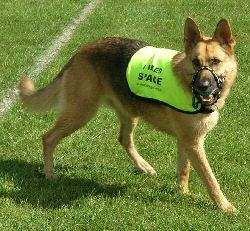 I then had the idea to produce Hi Viz lead and collar covers to compliment the vests. In addition, I now also have Hi Viz Space Dogs treat bags and other merchandise. I was so impressed with the fact that Judi does all the work in her limited free time that I also wanted to help her raise funds for the charity, so I decided that I would donate money from every sale of Space Dogs merchandise to the charity, to do my bit to help dog rescues - and this I will continue to do. How can Space Dogs help you and your dog at Agility? As we have said, there are many reasons why your dog might need a little extra space. Although a fabulous and fun place for your dog, an agility competition can also be a overwhelming experience for a dog. 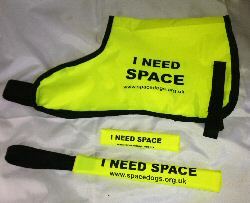 With so many people and other dogs about and the increased/new noises of public announcements etc., an 'I Need Space' vest can be an invaluable tool at least until the dog gets used to the scene. It's not meant to be used to warn people to keep away, but to ask for a little help so that everything about a show becomes a positive experience for the dog. Space dogs don’t need an area the size of Europe, just a few more feet. Training is paramount and an important part of the campaign. A few extra feet can make all the difference to a nervous dog. Dogs can get used to the noise and smells and watch other dogs from a comfortable distance so a positive association with dogs etc. realise that nice things happen at training. They won’t get overwhelmed. In the long run space coupled with training will mean the dogs will be right at home. Please share and make aware our poster on FB, your websites and social media networks. Posters are available on Space Dogs Facebook page and Group or you can email for a copy. Simply save to your computer and print off. Spread the word and get it displayed in local shops, vets, chip shops, in your car/van windows at agility - anywhere you can. Space Dogs will only ever promote Force Free Positive Reward Based Training and believes that training is an essential part of the Space Dogs campaign. There is also a Yellow Ribbon Trainers Scheme attached to the campaign. All trainers have been checked for experience and are positive reward based trainers so, if you need a trainer, you are guaranteed that you know what you are getting should you use one with Yellow Ribbon Trainer accreditation. 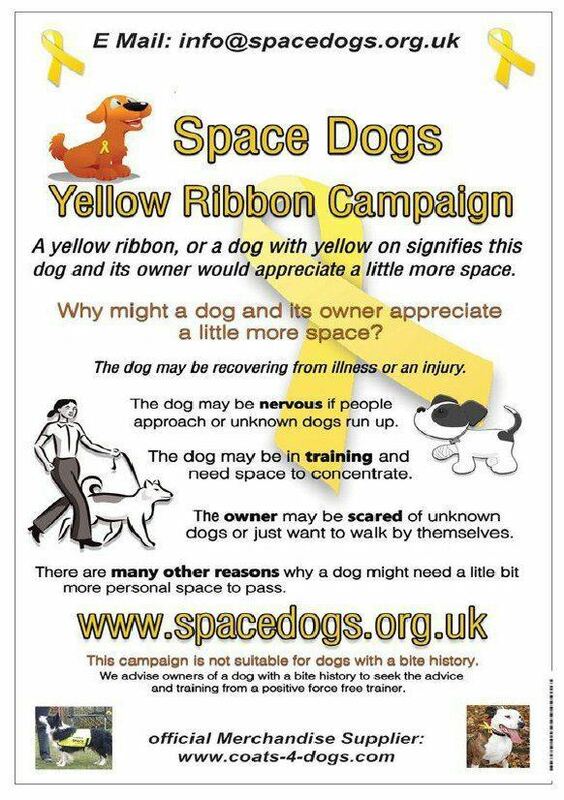 For more information about the Space Dogs Yellow Ribbon Campaign & Charity, email or visit the web site. 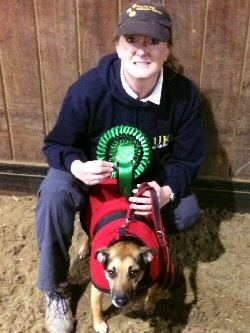 Joanne Livemore from Rayleigh, Essex has been doing agility for nearly three years with her two Parson jack Russell terriers and been competing just over two years. In this time, she has had great fun at the agility shows and qualified two years running for the UKA Beginners Steeplechase Finals. Her dogs were the inspiration behind her business ‘Coats For Dogs’ which has continued to grow worldwide. She makes a variety of made to measure coats, waterproof, drying, fleece and cooling coats as well as beds and training accessories. For every sale of ‘of I need space’ products, she donates to the Space Dog Yellow Ribbon Campaign and Charity. 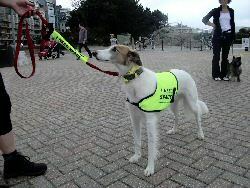 Her company Coats for Dogs is the Space Dogs official merchandiser for Hi Viz Space merchandise. Click here to see what is available.